Overall my research aims to elucidate how Gram-negative bacterial pathogens are able to successfully cause disease. This should provide both an improved understanding of basic biological processes and, ultimately, contribute to novel therapeutic antimicrobial strategies. Protein secretion systems are molecular machines used by bacterial cells to translocate specific sets of proteins out of the bacterial cell, either to the extracellular milieu or directly into target cells (eukaryotic or prokaryotic. Secretion systems, and the diverse proteins that they secrete, represent key virulence factors against eukaryotic host organisms. 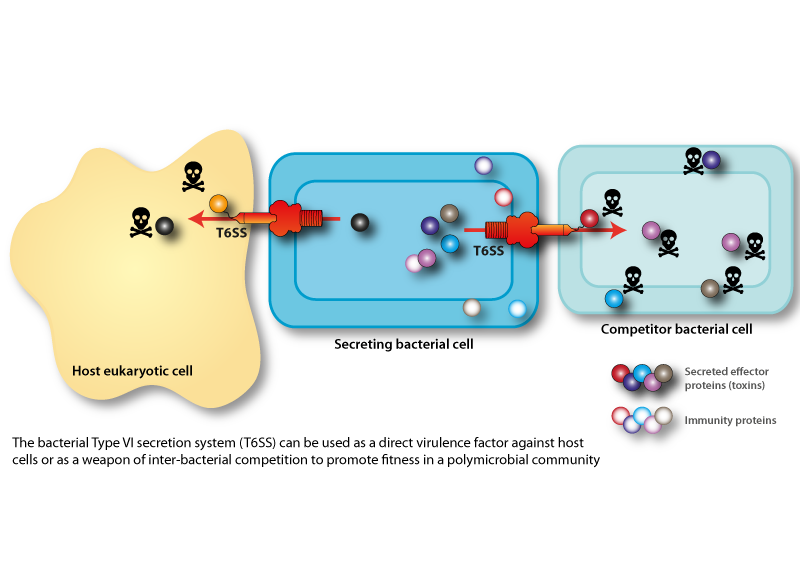 It is increasingly becoming recognised that protein secretion systems can also be important mediators of competition between bacterial cells, with such systems delivering anti-bacterial toxins. Our largest research area is the Type VI secretion system (T6SS), which is widespread in Gram-negative bacteria and is a complex, dynamic nanomachine which ‘fires’ toxic effector proteins into target cells. These target cells can be eukaryotic host cells, making the T6SS a classical virulence factor. More commonly, however, the target is rival bacterial cells, making the T6SS a key player in inter-bacterial competition and competitive fitness, and therefore an indirect virulence factor. We are interested in the molecular mechanisms and regulation of the T6SS machinery, but also in the identification and characterisation of new anti-bacterial toxins secreted by the system. 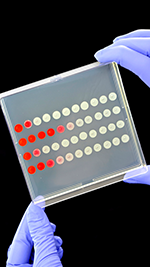 For many of our studies we use the potent anti-bacterial T6SS of the opportunistic pathogen Serratia marcescens as a model system. I also have past and present interest in other secretion systems, including the Type II secretion system. Competitive interactions between different strains and species of bacteria are widespread and key to defining the polymicrobial communities in which most bacteria exist. A potential pathogen must be able to compete against host microflora, other pathogens and other residents of environmental reservoirs in order to mount a successful infection. Multiple mechanisms of competition exist, both contact-dependent, such as the Type VI secretion system, and contact-independent, such as the production of diffusible secondary metabolites, including classical antibiotics. We are currently interested in the production of antimicrobial secondary metabolites and other inhibitory molecules by strains of Serratia marcescens and related organisms, in addition to our work on the T6SS. More broadly, I have had a long-standing interest in inter-bacterial interactions, including past work on quorum sensing in pathogenic Enterobacteriaceae. These include quantitative proteomics, genomics and non-mammalian virulence models. All together, these areas contribute towards a better understanding of how Gram-negative bacterial pathogens interact with each other and with the host organism to proliferate and cause disease. We study a number of Gram-negative bacterial pathogens, mostly members of the Enterobacteriaceae, including the human pathogens Serratia marcescens, E. coli and Klebsiella pneumoniae, and the plant pathogens Erwinia spp. Overall, we are a molecular microbiology group, utilising a variety of approaches from genetics, molecular biology and classical microbiology, through to biochemistry, proteomics and cell biology. Ostrowski, A., Cianfanelli, F.R., Porter, M., Mariano, G., Peltier, J., Wong, J., Swedlow, J.R., Trost, M. and Coulthurst, S.J. (2018) Killing with proficiency: integrated post-translational regulation of an offensive Type VI secretion system. PLoS Pathogens, 14, e1007230. Trunk, K., Peltier, J., Liu, Y., Dill, B.D., Walker, L., Gow, N.A.R., Stark, M.J.R., Quinn, J., Strahl, H., Trost, M. & Coulthurst, S.J. (2018) The Type VI secretion system deploys anti-fungal effectors against microbial competitors. Nature Microbiology, 3, 920–931. Mariano, G., Monlezun, L. & Coulthurst, S. J. (2018) Dual Role for DsbA in Attacking and Targeted Bacterial Cells during Type VI Secretion System-Mediated Competition. Cell Reports, 22, 774–785. Cianfanelli, F.R., Monlezun, L. & Coulthurst, S.J. (2016) Aim, Load, Fire: The Type VI Secretion System, a Bacterial Nanoweapon. Trends Microbiol, 24, 51-62. Stanley-Wall, N.R., Coulthurst, S.J. & Holland, I.B. (2015) A Snapshot of the Extraordinary World of Social Microbiology. J Mol Biol, 427, 3625-7. Alcoforado Diniz, J., Liu, Y. & Coulthurst, S.J. (2015) Molecular weaponry: diverse effectors delivered by the Type VI secretion system. Cell Microbiol, 17, 1742-51. Gerc, A.J., Diepold, A., Trunk, K., Porter, M., Rickman, C., Armitage, J.P., Stanley-Wall, N.R. & Coulthurst, S.J. (2015) Visualization of the Serratia Type VI Secretion System Reveals Unprovoked Attacks and Dynamic Assembly. Cell Rep, 12, 2131-42. Alcoforado Diniz, J. & Coulthurst, S.J. (2015) Intra-species Competition in Serratia marcescens is Mediated by Type VI-Secreted Rhs Effectors and a Conserved Effector-Associated Accessory Protein. J Bacteriol, 197, 2350-60. Hamilton, J.J., Marlow, V.L., Owen, R.A., Costa, M.de A., Guo, M., Buchanan, G., Chandra, G., Trost, M., Coulthurst, S.J., Palmer, T., Stanley-Wall, N.R., & Sargent, F. (2014) A holin and an endopeptidase are essential for chitinolytic protein secretion in Serratia marcescens. J Cell Biol, 207, 615-26. Iguchi, A., Komatsu, H., Nagaya, Y., Pradel, E., Ooka, T., Ogura, Y., Katsura, K., Kurokawa, K., Oshima, K., Hattori, M., Parkhill, J., Sebaihia, M., Coulthurst, S.J., Gotoh, N., Ewbank, J.E., Thomson, N.R. & Hayashi, T. (2014) Genome evolution and plasticity of Serratia marcescens, an important multidrug resistant nosocomial pathogen. Genome Biol Evol, 6, 2096-110. Gerc A.J., Stanley-Wall N.R. & Coulthurst S.J. (2014) The role of the phosphopantetheinyl transferase enzyme, PswP, in the biosynthesis of antimicrobial secondary metabolites by Serratia marcescens Db10. Microbiology 160, 1609-17. English G., Byron O., Cianfanelli F.R., Prescott A.R., & Coulthurst S.J. (2014) Biochemical analysis of TssK, a core component of the bacterial Type VI secretion system, reveals distinct oligomeric states of TssK and identifies a TssK-TssFG subcomplex. Biochem J, 461, 291-304. Fritsch M.J., Trunk K., Alcoforado Diniz J., Guo M., Trost M. & Coulthurst, S.J. (2013) Proteomic identification of novel secreted anti-bacterial toxins of the Serratia marcescens Type VI secretion system. Mol Cell Proteomics, 12, 2735-49. Srikannathasan V., English G., Bui, N.K., Trunk K., O’Rourke P.E.F., Rao V.A., Vollmer W., Coulthurst S.J. & Hunter W.N. (2013) Structural basis for Type VI secreted peptidoglycan DL-endopeptidase function, specificity and neutralization in Serratia marcescens. Acta Crystallogr D, 69, 2468-82. James, M.J., Coulthurst, S.J., Palmer, T. & Sargent, F. (2013) Signal peptide etiquette during assembly of a complex respiratory enzyme. Mol Microbiol, 90, 400-14. Coulthurst, S.J. (2013) The Type VI secretion system - a widespread and versatile cell targeting system. Res Microbiol, 164, 640-54. Sargent, F., Davidson, F.A., Kelly, C.L., Binny, R., Christodoulides, N., Gibson, D., Johansson, E., Kozyrska, K., Lado, L.L., Maccallum, J., Montague, R., Ortmann, B., Owen, R., Coulthurst, S.J., Dupuy, L., Prescott, A.R. & Palmer, T. (2013) A synthetic system for expression of components of a bacterial microcompartment. Microbiology, 159, 2427-36. English, G., Trunk, K., Rao, V.A., Srikannathasan, V., Hunter, W.N. & Coulthurst, S.J. (2012) New Secreted Toxins and Immunity Proteins Encoded within the Type VI Secretion System Gene Cluster of Serratia marcescens. Mol Microbiol, 86, 921-936. Gerc, A.J., Song, L., Challis, G.L., Stanley-Wall, N.R. & Coulthurst, S.J. (2012) The insect pathogen Serratia marcescens Db10 uses a hybrid non-ribosomal peptide synthetase-polyketide synthase to produce the antibiotic althiomycin. PLoS One, 7:e44673. Coulthurst, S.J., Dawson, A., Hunter, W.N. & Sargent, F. (2012) Conserved signal peptide recognition systems across the prokaryotic domains. Biochemistry, 51, 1678-86. Murdoch, S.L., Trunk, K., English, G., Fritsch, M.J., Pourkarimi, E. & Coulthurst, S.J. (2011) The opportunistic pathogen Serratia marcescens utilises Type VI Secretion to target bacterial competitors. J Bacteriol, 193, 6057-69. Rao, V.A., Shepherd, S.M., English, G., Coulthurst, S.J. & Hunter, W.N. (2011) The structure of Serratia marcescens Lip; a membrane bound component of the Type VI secretion system. Acta Crystallogr D Biol Crystallogr, 67, 1065-1072. Pérez-Mendoza, D., Coulthurst, S.J., Humphris, S., Campbell, E., Welch, M., Toth, I.K. & Salmond, G.P.C. (2011) A multi-repeat adhesin of the phytopathogen, Pectobacterium atrosepticum, is secreted by a Type I pathway and is subject to complex regulation involving a non-canonical diguanylate cyclase. Mol Microbiol 82, 719-33.